Artwork of Jenna Koenning | Inspired by the natural sciences, I use landscape painting as a means to express issues of personal importance. As I embark on new artistic endeavors, I decided that now is the time to finally start an artist blog that I had always wanted to tackle. It seems the perfect opportunity to document and share with those have interest in such things as my successes and failures, new processes I discover, and inspiration from others. Most of my artistic career, I painted with acrylics while dabbling in oils here and there and various drawing mediums, but in the last 3 years I have fallen in love with watercolor and use them almost exclusively. Up to this point, I found it easiest to paint on watercolor blocks – precut sheets bound together on their edges preventing the need to size or attach to a board of some kind. They work great for inexpensive framing since they come in standard sizes, and were ideal to take to my artist residency in Maine this last summer since I needed supplies that were easily packable for air travel. After 3 years of working with these easy, compact blocks, I recently decided it was time to push myself out of my comfort zone. For one, working strictly with blocks confined me to their standard sizes, with the largest I’ve found being 12 inches by 16 inches. Alternately, I worked a bit with individual watercolor sheets that come 20 inches x 30 inches, but even then I felt confined to their predetermined size. 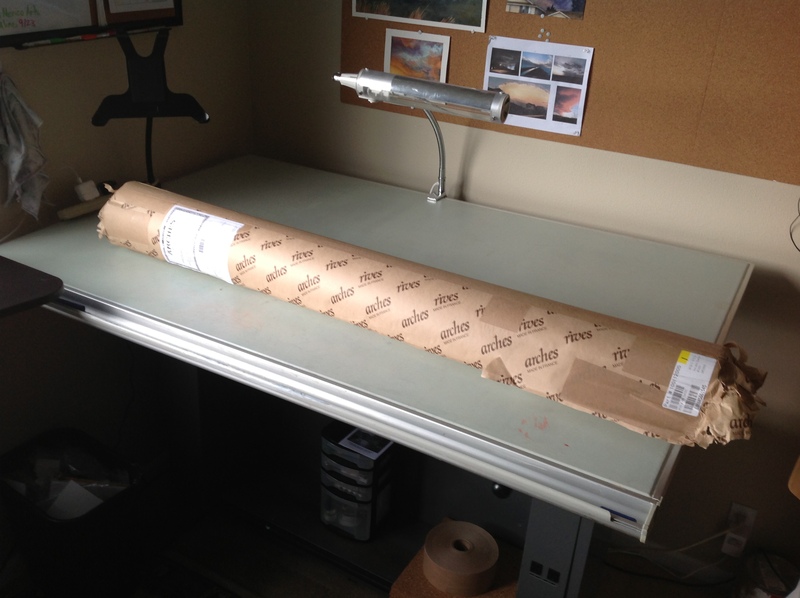 The ultimate choice was to purchase a large roll of watercolor paper. Not only will it be cost effective in the long run, but also with the roll measuring 4 1/2 feet by 6 yards, I can cut a wide range of sizes. As I learned from various web resources, the process for working with the paper after cutting the size of choice is to soak it in water for a few minutes. Once soaked, I taped the paper to my drafting table with brown packing tape, which also must be wet to adhere. After a few hours of drying, it is ready for the under-drawing. I am anxious to see if it buckles once I start painting (according my resources, it shouldn’t). 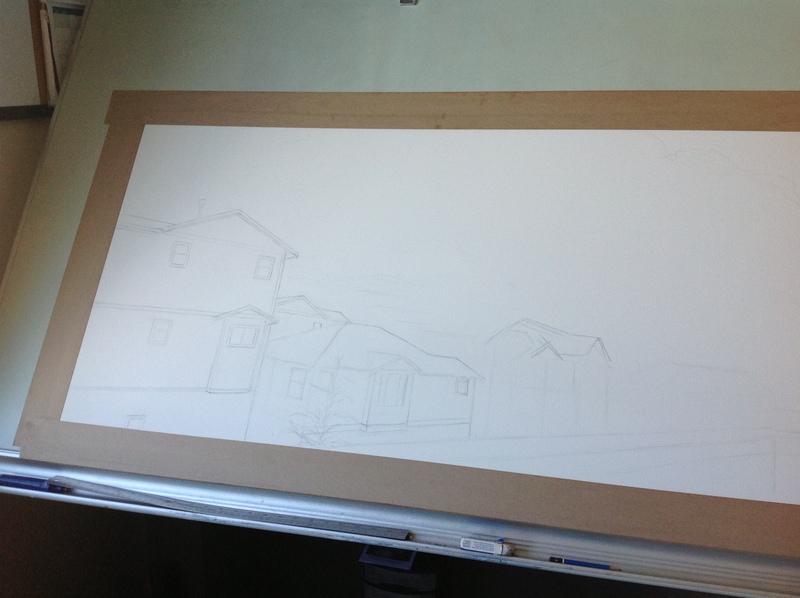 Here I’ve started the next in my series “Above the Rooftops” and the first of its size, roughly 4 feet by 2 feet.